A tenant farmer traditionally refers to a farmer who does not own the land that he lives on and works, but rather it is owned by a landlord. Generally, the landlord contributes the land, capital, and management, while the tenants contribute their labor, and possibly some capital. The returns from the crops are shared in a variety of ways, depending on the agreement between landlord and tenant. The rights the tenant has over the land, and the form of payment, also vary across different systems. In some systems, a tenant could be evicted at whim (tenancy at will); in others, he signs a contract for a fixed number of years (tenancy for years or indenture). In Europe, most tenant farmers were peasants. Types of tenant farming include sharecropping, some forms of peonage, and Métayage. Tenant farming is distinct from the serfdom of medieval Europe, where the land and the serfs were legally inseparable. In the twentieth century, in developed countries agriculture has changed and is carried out primarily by large, often multinational corporations. Various types of low skilled day workers, seasonal tenant farmers, and highly educated technological employees are utilized. In this form of farming also called agribusiness, much of the work is done by those who do not live on the land, rather they occupy it only temporarily during their period of work, moving on to other locations when the work is complete. Other forms of farming included family farms and farming cooperatives, both of which involve farming by the owner-occupiers of the land. Tenant farmers in history were often mistreated. Such a situation is well put in the past. However, the return to occupying the land, being the "tenant" of that land, is important for human happiness and survival. This would allow humankind to achieve a society in which we can act as good stewards of the land, which then satisfies so many of our needs. The history of farming starts when people began to cultivate the soil. They had small plots of land, and some form of division of labor. Generally, these small units based on some type of familial or tribal association came under the protection and/or dominance of the Feudalism/Feudal lords. These lords began the current notion of land ownership, which created the tenant farmer. Many types of tenant farming existed, often dependent upon the demands of the particular type of terrain and crop. For example, in the Unites States under the slavery system the slaves who had to work cotton or sugar were worked all year round and had relatively few rights. The crops demanded such incessant labor, the system seemed natural to the "owners." Those slaves who worked rice fields or other crops generally had many more rights, as those crops wee less labor intensive. Often such tenant farmers could keep part of their production and sell it and keep the money gained. Some of these slaves were able to save and buy freedom for themselves and family members. They were allowed Sundays off, whereas other workers of different crops may or may not have such available time. In Europe and the United States, the method of sharecropping developed where tenant farmers worked in various arrangements under an owner who was often absent. The modern, technological world has created a demand for educated and skilled workers in agriculture as well as the expected low-skilled laborers. Owners are responsible for large capital investments in equipment and supplies beyond the costs of land and taxation, storage and transport of the crops to the market or buyer, and risks require insurance against catastrophic losses from bad weather, floods, disease, or unpreventable events like bank foreclosures and war. The owner looks forward to greater rewards, whereas a tenant farmer invests his time and labor, and usually has both less risk and less reward in face of unpredictable weather and unstable market conditions. Sharecropping is a system of agricultural production that grew out of the former slave plantations in the American south after the American Civil War, where a landowner allows a sharecropper to work the land in return for a share of the crop produced on the land. There are a wide range of different situations and types of agreement: some governed by tradition, others by law. Legal contract systems such as métayage (French origin) and aparcería (Spanish) occur widely. Sharecropping typically involves a relatively richer owner of the land and a poorer agricultural worker or farmer; although the reverse relationship, in which a poor landlord leases out to a rich tenant also exists. The typical form of sharecropping is generally seen as exploitative, particularly with large holdings of land where there is evident disparity of wealth between the parties. The advantages of sharecropping include enabling access for women to arable land where ownership rights are vested only in men. The system occurred extensively in colonial Africa, Scotland, and Ireland and came into wide use in the United States during the Reconstruction era (1865-1876) largely as a replacement for the previous slavery system. Its use has also been identified in England (as the practice of "farming to halves"). It is still used in many rural poor areas today, notably in India. In colonial South Africa sharecropping was a feature of the agricultural life. White farmers, who owned most of the land, were frequently unable to work the whole of their farm for lack of capital. They therefore allowed black farmers to work the excess on a sharecropping basis. The 1913 Natives Land Act outlawed the ownership of land by blacks in areas designated for white ownership, and effectively reduced the status of most sharecroppers to tenant farmers and then to farm laborers. In the 1960s generous subsidies to white farmers meant that most farmers could now afford to work their entire farms, and sharecropping virtually disappeared. Sharecropping can have more than a passing similarity to serfdom or indenture and it has therefore been seen as an issue of land reform in contexts such as the Mexican Revolution. Sharecropping is distinguished from serfdom in that sharecroppers have freedom in their private lives and, at least in theory, freedom to leave the land; and distinguished from indenture in sharecroppers’ entitlement to a share of production and, at least in theory, freedom to delegate the work to others. 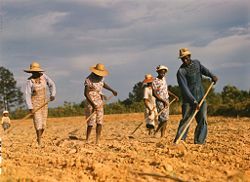 Sharecropping is often described as a vicious cycle, where though the tenant may originally seem to have rights, as time goes on they can become trapped in debt incurred as they must buy tools and supplies from the landlord's store at exorbitant prices and thus never be able to get out of debt. Sharecropping agreements can be made mutually beneficial, as a form of tenant farming or "sharefarming" that has a variable rental payment, paid in arrears. There are three different types of contracts. First, workers can rent plots of land from the owner for a certain sum, and keep the whole crop. Second, workers work on the land and earn a fixed wage from the land owner, but keep none of the crop. Lastly, workers can neither pay nor get paid from the land owner, rather the worker and land owner each keep a share of the crop. In archaic Spanish, the word "peonage" meant a person who traveled by foot rather than on a horse (caballero). The word denotes many low-skilled low status laborers, and in English has come to mean simply one who is used as a tool for the sake of others. In Latin America and other Spanish-speaking countries during the colonial period, a hacienda system of agriculture was utilized where laborers often eventually became part of an estate. Though not quite belonging to the land itself, as a serf would be, they were generally not free to leave the farming occupation for the landlord. This system began under the conquistadors, where the peonage provided laborers to farm newly acquired lands and often was a form of indentured servitude. In many Latin American countries currently, these tenant farmers are referred to as campesinos. The Metayage system (French métayage) is the cultivation of land for a proprietor by one who receives a proportion of the produce, as a kind of sharecropping. Métayage was available under Roman law, although it was not in wide spread use. In the area that is now northern Italy and southeastern France, the post Black Death population explosion of the late Middle Ages combined with the relative lack of free land made métayage an attractive system for both landowner and farmer. Once institutionalized, it continued long into the eighteenth century although the base causes had been relieved by emigration to the New World. Métayage was used early in the Middle Ages in northern France and the Rhinelands, where burgeoning prosperity encouraged large-scale vineyard planting, similar to what the ancient Romans had accomplished utilizing slave labor. Called complant, a laborer (Prendeur) would offer to plant and tend to an uncultivated parcel of land belonging to a land owner (Bailleur). The prendeur would have ownership of the vines and the bailleur would receive anywhere from a third to two thirds of the vines' production in exchange for the use of his soil. This system was used extensively in planting the Champagne region. Bailleur was also used as the term for the proprietor under métayage. In Italy and France, respectively, it was called mezzeria and métayage, or halving—the halving, that is, of the produce of the soil between landowner and land-holder. Halving did not imply equal amounts of the produce, but rather division according to agreement. The produce was divisible in certain definite proportions, which must obviously vary with the varying fertility of the soil and other circumstances, and which do in practice vary so much that the landlord's share was sometimes as much as two-thirds, sometimes as little as one-third. Sometimes the landlord supplied all the stock, sometimes only part—the cattle and seed perhaps, while the farmer provided the implements; or perhaps only half the seed and half the cattle, the farmer finding the other halves. Thus the instrumentum fundi of Roman Law was combined within métayage.Cite error: Closing </ref> missing for <ref> tag As the métayage practice changed, the term colonat partiaire began to be applied to the old practice of sharing-out the actual crop, while métayage was used for the sharing-out of the proceeds from the sale of the crops. Colonat partiaire was still practiced in the French overseas departments, notably Réunion until 2006 when it was abolished. In France there was also a system termed métayage par groupes, which consisted in letting a considerable farm, not to one métayer, but to an association of several, who would work together for the general good, under the supervision of either the landlord, or his bailiff. This arrangement got over the difficulty of finding tenants possessed of sufficient capital and labor to run the larger farms. In France, since 1983, these métayage and similar farming contracts have been regulated by Livre IV of the Rural Code. The system was once universal in certain provinces of Italy and France, and prevailed in places there through the end of the nineteenth century. Similar systems formerly existed in Portugal, Castile , and in Greece, and in the countries bordering on the Danube. Métayage was used in French colonies, particularly after the demise of slavery. And because of its utility métayage spread to nearby British colonies such as Nevis, St. Lucia and Tobago. It still occurs in former French possessions, particularly in Madagascar. The term métayage is also applied to modern-day flexible cash leases in French-speaking Canada. English writers were unanimous, until John Stuart Mill adopted a different tone, in condemning the métayage system. They judged it by its appearance in France, where under the ancien régime all direct taxes were paid by the métayer with the noble landowner being exempt. With the taxes being assessed according to the visible produce of the soil, they operated as penalties upon productiveness. Under this system, a métayer could have fancied that his interest lay less in exerting himself to augment the total share to be divided between himself and his landlord and instead be encouraged to defraud the latter part of his rightful share. This is partly due to the métayer relative state of destitute with the fixity of his tenure-without which the metayage cannot prosper. French metayers, in Arthur Young's time, in the years preceding the French Revolution, were "removable at pleasure, and obliged to conform in all things to the will of their landlords," and so in general they so remained. In 1819 Simonde de Sismondi expressed dissatisfaction with the institution of métayage because it reinforced the poverty of the peasants and prevented any social or cultural development. Yet even in France, although métayage and extreme rural poverty usually coincided, there were provinces where the contrary was the fact, as it was also in Italy, specially on the plains of Lombardy. An explanation of the contrasts presented by métayage in different regions is not far to seek. Métayage, in order to be in any measure worthy of commendation, must be a genuine partnership, one in which there is no sleeping partner, but in the affairs of which the landlord, as well as the tenant, takes an active part. Wherever this applied, the results of métayage appeared to be as eminently satisfactory, as they were decidedly the reverse wherever the landlords held themselves aloof. Historically, all land was occupied. Only recently with the advent of technological, corporate farming in developed countries has the phenomenon of non-tenant farming occurred. On a family farm, the owner is the tenant and does not usually lease the land to be worked. Such a family enterprise can be a source of great quality of life, but the work is always very demanding even when all is prosperous. This form emerged in Europe and the United States with the demise of Absolute Monarchy and the development of democracy and a middle class in Europe and the United States. The family farm has a continuous existence in developing countries where often larger extended families help work and organize it through their various structures of tribe and clan. In the United States, as the frontier expanded in a society of immigrants made up of many "self made" men, where the work ethic was strong, the family farm became a vehicle of entrepreneurship that could enrich a man beyond his previous expectations. In the 1790 census it was estimated that 90 percent of the population were employed in labor related to the farm. As technology increased, however, the larger farms needed more workers and the beginnings of corporate farming emerged. When fully mechanized, large corporate farms needed less and less human labor, until agriculture accounts for less than seven percent of employment. When the United States government called the loans in unexpectedly in the 1980s, referred to as the farm crisis, there was much public outcry in popular culture and legislature but the family farm had long been economically doomed and the major shift in the United States was toward non-tenant farming done by large corporations that used day laborers, mechanization, and highly skilled professionals. The large profits were noted by other farming enterprises in other developing countries, and soon others had begun these newer methods of farming. Much continued dialog continues about the virtue of the family farm, particularly in terms of quality of life and quality of the food products themselves. Cooperative farming has been one way of overcoming the economic limitations of the family farm. Cooperative farming exists in many forms. Various arrangements can be made through collective bargaining or purchasing to get the best deals on seeds, supplies, and equipment. For example, members of a farmer's cooperative who cannot afford heavy equipment of their own, can lease them for nominal fees from the cooperative. Farmers cooperatives can also allow groups of small farmers and dairymen to manage pricing and prevent undercutting by competitors. The Wisconsin dairy cooperatives started in reaction to the dominance of very large company owned enterprises and continue to be a successful example of tenant farming in the modern developed world. The first dairy cooperative in the United States was in 1841 in Wisconsin and as part of nine dairy cooperatives generated over $2.2 billion gross sales in 1999. These dairy cooperatives have remained viable throughout the twentieth century by utilizing continuous education and improvement in both the agriculture technology and methods and new social changes. One challenge was met by the diary cooperatives in Wisconsin through the successful lobbying of the United States Congress for subsidies for produce which in turn was used to provide surplus cheese for the needy. ↑ Pius S Nyambara. "Rural Landlords, Rural Tenants, and the Sharecropping Complex in Gokwe, Northwestern Zimbabwe, 1980s-2002." 2003. accessdate 2006-05-18, Centre for Applied Social Sciences, University of Zimbabwe and Land Tenure Center, March 2003. University of Wisconsin–Madison. ↑ Hugh Johnson. Vintage: The Story of Wine. (Fireside, 1992), 116. ↑ Excerpts from R. Dion’s “ Histoire de la Vigne et du Vin en France“ Retrieved November 25, 2007. ↑ "Le colonat partiaire" Clicanoo, Journal de l'Ile de la Réunion May 15, 2006; Retrieved November 25, 2007. ↑ Art. L. 462-28, French National Assembly, Law No 2006-11 of January 5 2006 Journal officiel de la République Française of January 6, 2006; Retrieved November 25, 2007. ↑ French Rural Code Livre IV Baux ruraux Retrieved November 25, 2007. ↑ D. Vassberg "Land and Society in Golden Age Castile" Retrieved November 25, 2007. ↑ Louis-Mathurin Moreau-Christophe, Du Droit a l'Oisiveté et de l'Organisation du Travail Servile Dans les Républiques Grecques et Romaine (Paris: Chez Guillaumin et Ce, Libraires 1849), 258-261. ↑ Bonham C. Richardson. The Caribbean in the Wider World, 1492-1992: A Regional Geography. (Cambridge University Press, 1992. ISBN 0521351863), 74. ↑ W. K. Marshall, (1965) “Métayage in the Sugar Industry of the British Windward Islands, 1838-1865." The Jamaican Historical Review 5: 28-55. ↑ International Labour organization (ILO) (April 2005) Dynamics in Social Service Delivery and the Rural Economy of Madagascar: Descriptive Results of the 2004 Commune Survey Retrieved November 25, 2007. ↑ Robert C. Allen, and Cormac Ó Gráda, "On the Road Again with Arthur Young: English, Irish, and French Agriculture during the Industrial Revolution," Journal of Economic History 48 (1988): 93-116. Allen, and Cormac Ó Gráda, "On the Road Again with Arthur Young: English, Irish, and French Agriculture during the Industrial Revolution," Journal of Economic History 48 (1988): 93-116. This page was last modified on 18 November 2015, at 21:28.